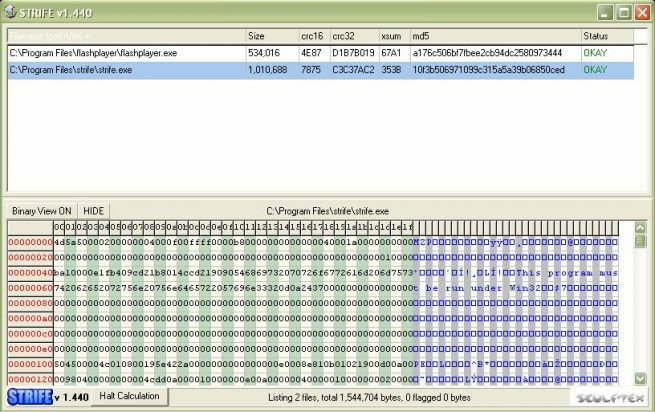 To convert browser checksums and md5 hashes of lists of files, also hex viewer function. There are no specific requirements, untested later versions of Windows. There is no installer. Simply unzip the strife.exe file and store in a folder on your computer. You may wish to create a folder in c:\Program Files\ such as c:\Program Files\strife\ and put the file in there. You can create a desktop shortcut or whatever for your convenience. There may be some features that don’t work properly, the “Send Flagged to Recycle Bin” was supposed to do just that (as I did not want the responsibility of my app deleting files in an irretrievable way) but I think it only worked in Windows 98. This application has been downloaded over 10,000 times! There are over 6,000 times from Softpedia, over 2,000 from FreewareFiles and several thousand from my old website. This project is about 15 years old yet there is not much similar to it available, so I decided to dust it off and make it available. I will gratefully accept feedback but I do not plan to make any improvements or bug fixes unless there was a particular demand.